The Divine Crusader is an easy to qualify for prestige class from Complete Divine. The class is especially good for martial characters, who will gain the ability to cast some spells at a fast progression, with charisma as a main casting statistic. The Divine Crusader has a really narrow spell list, as it can cast spells from a selected domain. Generally, optimization involving Divine Crusader usually focuses on prestige classes that grant additional domains (e.g. Contemplative). However, as written, the class can cast only spells from her chosen domain and has an effective spell list of only nine spells. As such, this guide is going to focus on Divine Crusaders that can cast spells only from a single domain, not cleric-wannabe builds (since straight cleric is better than over-dipping prestige classes for additional domains to expand your spell list). However note that some prestige classes that offer domains (e.g. Sovereign Speaker or Ordained Champion) will let you add the spells of the bonus domain you receive to your spell list, which probably works with Divine Crusader. It is also unclear if you are able to select a planar domain, from Spell Compendium, as they require from a cleric both his two domain choices to access one. Finally, there are many domain powers that use cleric level that do not grant bonus skills to the Cleric class (as those are added to the Divine Crusader's skill list by RAW); since you probably won't have any Cleric levels, these granted powers will be worthless to you, so you might want to ask about adapting them to Divine Crusader levels or swapping them for something entirely different. These are questions for your Dungeon Master, to dispel any doubts you may have. Since most of the times you are going to focus on a single domain, you need to make sure that each spell counts. Remember that you gain the domain's granted power, too. You might have a faster-than-usual progression, but your caster level is going to be at least seven caster level less than a full caster at your level. This makes the practised spellcaster feat (and the four ranks of spellcraft it requires) almost a necessity, or, as I like to see it, a hidden requirement of the Divine Crusader prestige class. Since your caster level is going to be less than normal and you come from a martial background, selecting a domain that contains buffing spells is almost always a good choice. Another relatively easy way of increasing your caster level include the Illumian race with the Krau sigil and the divine adaptation of the Abjurant Champion prestige class (using the 5th level granted special ability). Another reason that buffs is probably the best way to go, is the casting statistic of your spells: having a high charisma is handy, but not vital for martial builds. Sure, there are nice charisma-based abilities out there, like a Paladin's divine grace, a Crusader's Indomitable Soul and the turn undead feature, but not good enough to over-focus charisma for them. Remember that another 'hidden' requirement is that you have to have the same alignment with that of your chosen deity. This is important, because it limits the amount of base classes you are allowed to take before entering the Divine Crusader prestige class. Barbarian PHB : The barbarian is a very good class, although it has no charisma synergy whatsoever, only if you can use the alternative class features that have been printed in various sourcebooks. A barbarian has to be nonlawful. More than three levels in it are probably reduntant. The Unearthed Arcana variant that gives a Favored Enemy progression and the archery combat style, along with Lion Totem barbarian from Complete Champion are both good trades. Fighter PHB : Only useful if you need a couple of fighter feats. Still, there are far better base classes you can use. Hexblade CW : The Hexblade is a very good base class to enter the Divine Crusader prestige class, packed with charisma synergy. You can even use it exclusively, by taking all seven levels. A hexblade has to be nongood. 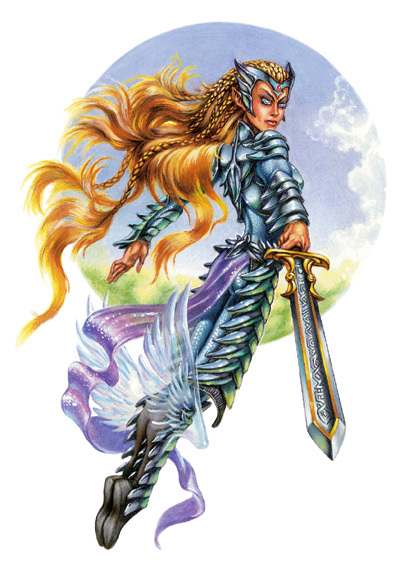 The class features the Hexblade's Curse ability, which lowers several rolls of a target for a large amount of time and is charisma based; Arcane Resistance, which stacks with Divine Grace and provides more charisma synergy; Mettle, which is a solid ability and a lot more useful than its reflex-based relative, Evasion; Summon Familiar, a personal favorite of mine, which you can also swap for the Dark Companion alternative class feature, which is a lot more durable (can't die!) and debuffs your opponents without a save (remember that at the same level you get an arcane caster level, because you gain spells, which means that you are eligible for the Obtain Familiar feat, so you can have both - it might be even more feat intensive, but you can also gain an Improved Familiar this way, using Obtain Familiar, Practiced Spellcaster and Improved Familiar fets); a bonus feat from a specialized list, which can also be Combat Casting, useful if you want to top the Divine Crusader with the divine adaptation of the Abjurant Champion prestige class; finally, Greater Hexblade's Curse comes at level seven, which is the second best upgrade of your curse (the other comes at level 19!). Hidden bonuses include using spell trigger items, like wands, because of your spell list and the ability to make use of eternal wands. Note that the class's designer has posted some suggested fixes for the class, because it is naturally underpowered compared to base classes that came later. You can find the suggested fixes in the Hexblade's Handook, here. Paladin PHB, UA : Paladins have a good list of special abilities, but their main problem is the alignment restrictions they have. If the Unearthed arcana variant Paladins are not allowed, then this class immediately becomes a lot worse, because you are limited only to Lawful Good gods. Otherwise, you can be of any non-neutral alignment (Lawful Good, Lawful Evil, Chaotic Good, Chaotic Evil). Paladins have Turn Undead, while providing a full base attack bonus progression, which opens up useful Divine feats for the Divine Crusader, like Divine Metamagic and Divine Might and Divine Grace is a big and welcome boon to your saves. The other special abilities, like lay on hands, divine health, etc, are handy, but not essential for your survival; as such, you can easily swap them for alternative class features, if they apply. Paladin of Tyranny and Paladin of Freedom both have very good auras: -2 to saves or immunity to compulsions are probably better than immunity to fear effects. The Holy Warrior alternative class feature from Complete Champion denies you access to Paladin spells (and the ability to use spell trigger items) and in return you can select a bonus feat, including any divine feat, a handy way to get Divine Power as soon as possible; note however that paladins get lesser restoration at spell level 1, which can be used with the Mitigate Suffering reserve feat and abilities that harm your ability scores when used. Ranger PHB : The ranger class does not offer any critical charisma related abilities, but it's generally a good 'shell', as it offers a high amount of skill points, bonus feats and two good saves. Rangers receive a high amount of alternative class features, which come in handy: Arcane Hunter from Complete Mage provides you with Favored Enemy(Arcanists), which covers a wide category of creatures (some Undead, most Dragons, several spellcasters); Champion of the Wild from Complete Champion is like Holy Warrior for the Ranger class, however the provides feats are not that good; Distracting Attack is very good to swap your probably useless Animal Companion; the Shooting Star substitution levels limit you to Mystra as a Deity (which isn't exactly limiting, because she does have access to some powerful domains) and it's probably the best substitution levels for a ranger out there; Spiritual Connection from Complete Champion is a lot better than Wild Empathy; Spiritual Guide lets you Commune with Nature once per day, instead of gaining an Animal Companion; Trap Expert from Dungeonscape gives you Trapfinding if need be; Urban Companion from the Cityscape Web Enhancement gives you a familiar-like companion, which is a lot better and you don't even care if it dies, because you can replace it easily. Soulborn MoI : Soulborn as a dip does not grant you any soulmelds or Essentia, but it's handy as a two or three level dip. The second level dip will grant you an immunity to a certain effect, depending on your alignment, which is quite good. The third level grants you one bonus incarnum feat. Remember that Soulborns have an alignment restriction, as you have to be non-neutral (Lawful Good, Lawful Evil, Chaotic Good, Chaotic Evil). Swashbuckler CW : You can use it to gain Weapon Finesse and the Arcane Stunt alternative class feature, but otherwise, the Swashbuckler is not very useful. Samurai CW : Move along. The most useful thing is doing Imperious Command and Staredown together, but other than that, no. Duskblade PHB II : This class does not have any charisma synargy, but it does have some useful abilities. Arcane Attunement and the spells that the class provides both give some cantrips and the ability to use eternal wands; free Combat Casting is useful if you want to top the Divine Crusader prestige class with the divine adaptation of Abjurant Champion. Finally, depending on your domain's spells, Arcane Channeling can prove especially useful. Knight PHB II : The Knight has some charisma synergy, but only with the Knight's Challenge ability. A Knight has to be of Lawful alignment. The Bulwark of Defense is quite good, but more than three of four levels (for the bonus feat) are probably redundant. Also, the Knight's Code is a limiting factor. Crusader ToB : You can't really go wrong with this class, as it has almost anything you need as a base. It has good charisma synergy (Indomitable Soul, several maneuvers). Crusaders can be of any alignment, except true neutral. Steely Resolve is a damage buffer, which also provides you with combat bonuses with Furious Counterstrike and act as bonus effective hit points; Indomitable Soul will boost your will saves, based on your charisma modifier, which unfortunately doesn't stack with Divine Grace; Zealous Surge is a free reroll to a saving throw, which is obviously very good. At last, but not least, you gain maneuvers and stances, which is the real benefit of the class, including from one unique Crusader-only discipline (Devoted Spirit). Warblade ToB : As with Crusaders, Warblades have access to maneuvers, including the useful White Raven. However, they have intelligence synergy, instead of the more useful charisma to Divine Crusaders. Strength Domain PHB : The Strength domain is beautiful for any melee character. In the early levels it packs very good buffing spells: Enlarge Person, Bull's Strength, Magic Vestment, Spell Immunity and Righteous Might. Stoneskin is good, but it has a costly material component, so you might opt to memorize Righteous Mights in your 6th level slots instead. The various Hand spells are handy and [Force], so you can also make use of some reserve feats, like Blade of Force or Invisible Needle. Unfortunately Strength domain's granted power is worthless, unless you can adapt it to work according your Divine Crusader class level. Travel Domain PHB : The Travel domain won't help you by providing buffing spells, but it does add a lot of mobility: Longstrider, Fly, Teleport, Dimension Door and Greater Teleport. It also adds some divinations: Locate Object and Find the Path. You also get Survival as a bonus skill. As with Strength domain, the Travel domain has a granted power that is based on your Cleric level, but having auto-Freedom of Movement that can operate multiple times a day is very useful, if you can get it adapted to be based off your Divine Crusader class level. War Domain PHB : The War domain contains some good buffing spells, like Magic Vestment and Divine Power. Spiritual Weapon is good at most levels. Blade Barrier is a [force] effect and can power the appropriate feats. Power words are not that great, because they allow spell resistance and are [mind-affecting], even though they don't allow a save. Note that if you choose War as your chosen domain, it's a very good idea to pick the Holy Warrior reserve feat, too, as it will give you a flat bonus to your damage rolls equal to your highest spell you've got available to cast. War domain's biggest problem is its granted power, because you will already possess the feat, as it is a requirement of the Divine Crusader prestige class. Celerity Domain SC : The Celerity domain is good for dexterity based characters, including ranged and melee ones. Especially the low level spells (Cat's Grace, Blur and Haste) are very useful. The domain list features some mobility enhancement (Tree Stride, Expeditious Retreat and Wind Walk), a mass Cat's Grace and the very good Greater Blink at high levels. Time Stop at level 9 ensures that you can at least get some free buffing rounds, to make use of your low level goodies. The granted power is not anything special, but it isn't an enhancement bonus (as bonuses to any speed usually are) and it doesn't have anything to do with Cleric levels. The Celerity domain is available for the following alignments: Neutral, Chaotic Neutral, Neutral Good. Competition Domain SC : Competition is one of those domains that has very good spells and most of them are good candidates for Persistent Spell. You should think about getting paladin levels for Turn Undead and the Divine Metamagic feat. The Competition domain has a unique power that adds one point to any contested roll you make. Spell-wise, Zeal is a swift action that grants you bonus against attacks of opportunity and lets you move through opponents as though they were allies. Prayer, Divine Power and Righteous Might are all good low-level candidates for Persistent Spell, as is the Greater Visage of the Deity the domain provides at 9th level. Moment of Prescience has a very good duration and will ensure that you'll win the initiative and finally Zealot Pact, Remove Fear and Regenerate are also situationally good. Note that the Competition domain is also available from Kord, a core deity. The Competition domain is available for the following alignments: Chaotic Good, Neutral, (Neutral Good). Mysticism SC : Mysticism has a great selection of spells that are fit for combat, like Divine Favor, Spiritual Weapon, Weapon of the Deity and Righteous Might. Mysticism offers all three types of Visage of the Deity (lesser, normal and greater), which are typically great buffs, as even the lesser one provides you with a charisma bonus, further increasing your synergies and also giving you energy resistances. Finally, it features Holy War/Blasphemy, which, due to your caster level won't be that useful and Holy Aura/Unholy Aura, which are typically great buffs. The domain power is unfortunately useless, as it lasts one round per Cleric level. The only deity that offers the domain I could find was the Radiant Flame, from Player's Guide to Eberron, and it's Lawful Good. In Complete Divine it mentions that deities of Neutral, Lawful Neutral and Chaotic Neutral alignment do not offer this domain. Spell Domain SC : This domain is mentioned, because it offers two great spells, the Anyspell series, which will let you prepare wizard spells in your domain spell slots. The problems that arise are many: Are all of your spell slots domain slots? If yes, then you're not free to memorize as many wizard spells you'd like, as you need a spellbook and each casting of Anyspell takes 15 minutes. Finally, you need to have a high Wisdom score to cast those Wizard spells, because of Anyspell's wording. The spell domain also provides you with Mage Armor, Silence and the powerful Limited Wish, Antimagic Field and Mordenkainen's Disjunction. Antimagic Field alone could warrant the usage of Divine Metamagic (Persistent) in conjuction with Extraordinary Spell Aim. Rary's Mnemonic Enhancer can get you additional spell slots for that Anyspells and Break Enhancement is situationally good. The deities offering this domain are of Lawful Neutral, Chaotic Good, Neutral Good and Neutral alignments. Summoner Domain SC : This domain can be used to transform you into a completely different type of caster. A Divine Crusader's spell list is limited, but with summoning spells you get a very different and versatile selection. You can even cast spells (with only a minor investment) as if you were a full caster, as the domain's granted power gives you a +2 bonus to your caster level for conjuration(calling) and conjuration(summoning) spells (which means, everything you are able to cast); so between practiced spellcaster, the domain's granted power and the optional Summon Elemental reserve feat, your caster level will be equal to that of a full caster. The summoner domain is granted by deities of Chaotic Good and Neutral Evil alignments. Also note that it's a good idea to get the Malconvoker prestige class from Complete Scoundrel. Holy Warrior CC : The Holy Warrior reserve feat is a must have if you have selected the War Domain. You gain a flat scalable bonus to your weapon damage rolls, as long as you don't expend your highest-level War spell; the wording is somewhat weird, it doesn't mention domain slot, but "War spell", which probably means that if you memorize a war domain spell in one of your normal spell slots you get the bonus normally. The +1 caster level to force spells is just the icing on the cake. Divine Metamagic CD : On Quicken Spell, so that you can cast your buffs quickened. You can also opt for Divine Metamagic (Persistent Spell), but that's probably too feat intensive for a martial-inclined character. The Cleric's Handbook mistakenly suggests that you don't have to possess the feat to apply Divine Metamagic, as per Complete Divine errata. Practiced Spellcaster CD : As said before, this feat is the 'hidden requirement' of the Divine Crusader prestige class. Getting a bonus to your caster level will enable you to at least keep your buffs from being easily dispeled, if not on par with the primary spellcasters. Divine Might CW : Apply your charisma bonus to your damage rolls. This feat requires Power Attack, which is completely fine, as it's a powerful feat. Divine Shield CW : For a number of rounds, equal to one round per two character levels, you get a bonus to your shield bonus to AC equal to your charisma. This is a very easy way of getting your charisma to AC. Your natural's shield AC combined with divine vestment, this feat and Shield Ward PHB II can heavily optimize your touch AC, too. Domain Focus CD : Practiced Spellcaster is strictly better. Spontaneous Domains CC : Note: This feat is only useful if you use the Sovereign Speaker or similar prestige class, that gives you access to multiple domains. Otherwise it's not useful at all. If your DM rules that all your spell slots are domain slots, since you can only cast domain spells, then this feat is awesome and you should really take it as soon as possible. Imperious Command DotU : The Divine Crusader prestige class has intimidate as a class skill, as most of the best good base classes for entry. Since you're going to have a good charisma score and can effectively demoralize (your good base attack bonus helps here), there is no reason to skip this wonderful feat. Blade of Force CM : Blade of force requires you to have a [force] spell memorized. It takes a swift action to activate, you ignore the concealment of incorporeal creatures and gain a bonus of 1 bonus point of damage per level of your higher [force] spell you have memorized, but the downside is that it's only for a single attack. You can use this reserve feat at high levels with the Strength domain 'hand' spells, if not with the Force domain. Invisible Needle CM : As above, this is a reserve feat based on [force] spells. You gain an attack and deal 1d4 per spell level of your higher available [force] spell you have available to cast. You can use it to gain a reliable short-range ranged attack, but remember that the big downside is that it requires a normal attack roll, not ranged touch attack.